From Washington, D.C.’s famous Watergate Hotel to the historic Cavalier property in Virginia Beach, Douglas Henkel has played major roles in some of the most substantial real estate deals in the hospitality industry, closing more than $1 billion in hotel deals in the past two years alone. Not bad for a guy who began selling residential properties 43 years ago because he couldn’t afford graduate school. Today, Henkel, executive vice president with CBRE/MidSouth, leads the company’s hotel brokerage practice out of its Norfolk office, closing deals on hospitality properties throughout the U.S., Mexico and the Caribbean. 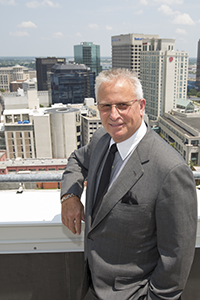 The top producer for CBRE/Hampton Roads and the firm’s Mid-South region in 2013, he was also recognized in the company’s Colbert Coldwell Circle of the Top 100 performers in North America last year. “For a Norfolk broker to be in the top 100 CBRE brokers nationally is an incredible accomplishment we all take pride in,” J. Scott Adams, president of CBRE’s Mid-South region, said of the award. Other high-profile transactions in Henkel’s portfolio include the $53 million sale of The Driskill Hotel in Austin, Texas, the $27 million sale of the Barcelo Radisson Hotel in Orlando, Fla., the $40 million sale of the Kingsmill Golf Resort & Spa in Williamsburg, the $13.7 million sale of the Sanderling Resort & Spa in Duck, N.C., and the $41.9 million sale of The Watergate Hotel. In addition, he was a member of the CBRE group that secured a $550 million deal for Hilton Hotels to develop a 500-room Waldorf Astoria and a 1,000-room Hilton at Bonnet Creek Resort outside Orlando.